Because there are no trains on Guam, the main means of transportation is cars. It is recommended to use the shuttle buses around the shopping centers and the hotels. Shuttle buses provided by optional tours such as ABC will take you to the optional tour specific location. Taxi and car rental are other ways of transportation. Let’s always walk in the direction opposite to the direction of the car. For safety at night, walk with two people(or more) and walk in places with plenty of traffic and bright places. Let’s use a crosswalk with a signal when crossing the road. In the case of a push-button type signal, you can cross if the display is walking. If it is blinking, it will be a red sign soon. Let’s pass quickly. In the case of hand shaped display, it means red light and crossing should not be done. When crossing the traffic lights at the intersection, be careful of turning cars. There is a shuttle bus that connects Tumon, Tamuning, Agana village (Hagatna) area, etc. The shuttle bus that connects shopping points operates frequently, so if you are doing things around the hotel area, mainly in the area of ​​Tumon, Tamuning, Agana (Hagatna), you will rarely feel inconvenienced by using shuttle buses. Tickets for the shuttle bus are sold at the tour desk in the hotel, in the Guam airport, at the ticket booth set up at the shopping centers. Even if there is no ticket in advance, you can also purchase it from the driver at the time of getting on. In Guam, cars drive on the right hand side of the road center line, with the car having a left side steering wheel. The position of the signal levers and the wipers are attached to the reverse of a Japanese car. Speed ​​is displayed in miles and 1 mile is about 1.6 km, the speed limit is about 15 miles per hour (about 24 km to 40 km) in the city area and 35 miles per hour (about 56 km) in the suburbs. Pay attention to and follow signs of speed limit. From the end of March 2012, the use of mobile phones while driving is prohibited. As in Japan, contact with police or fire department for hands-free use or emergency, parking in a safe place is permitted by law. Please note that offenders will be fined 100 US dollars or more. Wearing a seat belt while driving is required. Please keep in mind that rules on child safety seats as follows. Newborn baby ~ 1 year old (or weight 20 pounds / up to about 9 kilometers): Set backward facing in the rear seat. 1 to 4 years old (or weighing 20 to 40 pounds / about 9 to 18 kilometers): Set forward facing in the rear seat. 4 to 8 years old (or 40 pounds / about 18 kilograms or more): Using a booster seat in the rear seat. Age 8 years old and over 4 feet 9 inches (about 145 cm) or more: use a seat belt in the rear seat. * In case of a safety violation, there is a fine of 100 US dollars or less for the first offense and less than 200 US dollars as a repeat offense (within 1 year). You should not overtake the school bus when it stops. A car behind the bus has to stop at the back until the school bus continues moving forward. Please wait patiently. Furthermore, you must also stop for the bus if you are in the oncoming lane. This rule will not change even on a wide road like 3 lanes on one side. If you overtake or pass by a bus without stopping you will be fined for a traffic violations. When the sign of STOP is open like this ,let’s stop and wait. Except when there is a sign of “NO (RIGHT) TURN ON RED”, you can turn right at a red light if you pause. Even when turning right is possible, there are pedestrians in the crosswalk so take care before turning right. On some parts of Guam’s road there is a road mixed with corals, and on rainy days it is very slippery so let’s drive safely. In Japan there are people who turn off the headlight at the signal light waiting, but never turn off the headlights on Guam. It is a traffic violation. 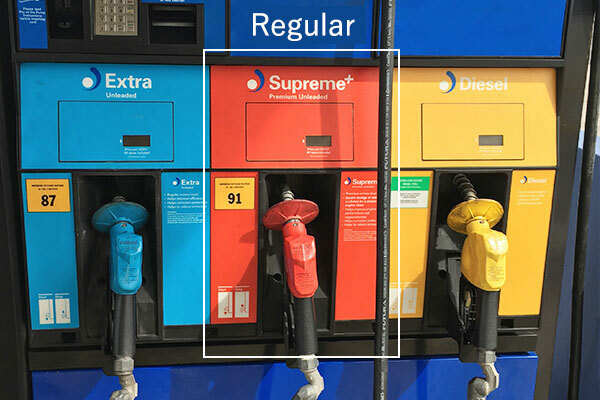 There are various kinds of gasoline as follows, but most gas stations are handled as “Regular”, “Plus / Super”, “Super / Premium”. Basically it is “Regular (Regular)” gasoline that is used when renting a car and putting in gasoline. The gas station is divided into self-service and full-service machines. As with Japan, self-service is less expensive. Park your car next to the refueling machine on the side of your cars gas tank. Go to the cashier and tell the number of the refueling machine and the type of gasoline you want. Pay a deposit (advance payment). In other words, if you want to add regular $10.00 for a refueling machine No. 5, say “Number Five. Regular Ten dollars please”. If you want to fill regular with a No. 5 refueling machine, say “Number Five. Regular Full It Up Please”. After telling the number of the refueling machine, the type of gasoline and the amount of gasoline to be filled in, return to the refueling machine outside. Go to the cashier and tell the number of the refueling machine and settle payment. Refueling is completed after receiving the change deducted from the money paid as the deposit. If arrested for drunk driving, in addition to detention for at least 2 days and a fine of US $1,000.00, other penalties may be imposed. Vehicle vandalism aimed at rent-a-car has occurred (especially beaches, parks, public parking lots, and parks, etc. ), valuables such as cash, passports, mobile phones and so on may be stolen. When you stop the car on the street or at a parking lot, please be careful as to whether there are any suspicious people / cars around you. Let’s keep valuables in the trunk of the car for better security.